Dhaka, Dec 11 (Just News): Rain has forced to suspend the second qualifier of Bangladesh Premier League (BPL) between Rangpur Riders and Comilla Victorians for the day on Sunday. 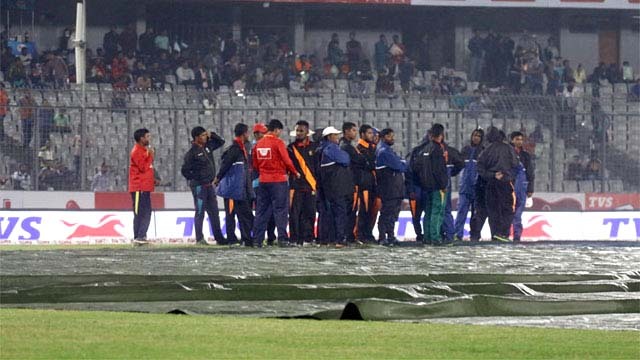 The match will resume on Monday from where the teams were forced to left off due to rain. Rangpur Riders scored 55 losing Chris Gayle in seven overs. Rangpur skipper Mashrafe Bin Mortaza said, "Playing conditions are important. Many thanks to Tamim for honouring this decision and for the sake of BPL we will play tomorrow." Comilla Victorians captain Tamim said, "For the sake of the BPL, we will have a game tomorrow. For tomorrow, we can plan better now."